After tasting a bit of busy city life in Bangkok and a few days of soaking in the mountainous scenery in Chiang Mai, we headed south for our much-awaited beach time in the ever amazing Phi Phi Islands. As always, PP Princess Resort helped us plan the trip and we couldn’t be more thrilled upon arriving at this amazing Resort. PP Princess Resort – The best resort in Ko Phi Phi Don! PP Princess Resort is a beach retreat on the paradise, Phi Phi Don Island, overlooking the stunning white sands and the azure blue Andaman Sea. The prime location of the resort places guests just a few steps away from the island’s popular sunbathing beach, water activities, village centre and the main pier. On our doorstep are all the facilities of Tonsai Village with loads of restaurants, entertainment, shopping, nightlife(party scene). Another highlight is that the resort can be easily reached within a 5 min walk from the Tonsai Pier. So, there is no need to worry about getting transport from the pier to the resort. PP Princess resort makes the ideal base for exploring Ko Phi Phi Don as you are just a few minutes away from the beach, Phi Phi Viewpoint, rock climbing, kayaking & snorkelling and other water activities. It is the centre of the Tonsai village and close enough to enjoy all the activities of both Loh Dalum Bay and Tonsai Bay. The Friday pool parties at the resort’s infinity pool are the popular attractions here. From the moment we set our foot on the island pier, they did everything to make our stay as perfect as possible, even escorting us from the pier point. The check-in was quick and efficient. The staff was amazing. During the check-in, we were presented with cool towels and mineral water. Even though we’d arrived in an air-conditioned ferry, this was still a very welcoming gift at the humid island! 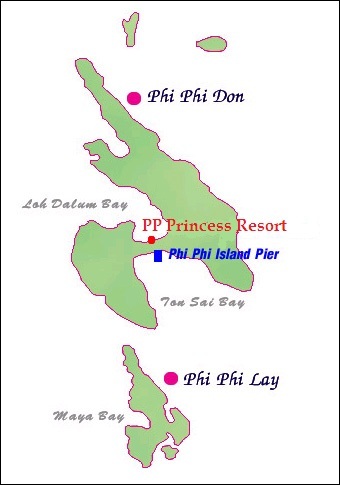 How to get to Phi Phi Island and PP Princess Resort? You can reach P P Island via Krabi or Phuket by taking morning boats or afternoon boats of about two hours, then walk about 200 meters from the Phi Phi main pier(Ao Tonsai Pier) and safety arrive at the paradise for economy tourists. During the peak season, there is a daily morning boat from Ao-nang Beach to Phi Phi and daily morning and afternoon boats from Ko Lanta Island to Ko Phi Phi Don Island. PP Princess Resort is in an excellent location on the Phi Phi Islands within easy reach of all the islands amenities and attractions. It is just a few steps away from the Ton Sai Beach and the Loh Dalam Beach behind the Ton Sai Village, a favourite sunbathing spot where the sands are wonderfully soft and the sea is super clear. The small bay is almost surrounded by limestone cliffs offering gorgeous unforgettable views. There are plenty of activities to do on the beach with kayaks available for rent, massage services and other sporting activities. However, if you prefer to go for souvenir shopping, the markets in the village are a five minutes walk from the resort. The Ton Sai Pier, where guests can embark on a boat trip to discover Maya Bay or depart on the next leg of their journey, is only 200 metres away from the resort. We enjoyed the large infinity pool, an abundance of sun lounges and trees for shade. They have a bar attached to the pool to bring you the well-deserved vacation cocktail while you relax and sink into the beautiful view of the sea. When you swim out to the edge it is both mesmerising and calming watching the boats go about their day on the sea. There are beds built right into the pool, so you can keep reading your book or sunbathing while enjoying the cool waters. This infinity pool is a new addition to the resort and it complements the panorama suites very well. Munching at the restaurant was our favourite moment at the resort. We enjoyed dining on delicious Thai and international cuisines directly on the beachfront at Blue Marine Restaurant, one of the most popular restaurants on the island at the beach front. Restaurant specialises in local and international cuisines and serves breakfast, lunch, and dinner with its oceanic views. There is a good range of tastefully decorated cottages and villas with views of the cliffs and glimpses of Loh Dalum Bay from the top floor. All room types at PP Princess are modern with facilities that include free WiFi, air conditioning, hot and cold showers, western toilets, satellite TV, an in-room safe, refrigerator with complimentary bottled water and tea and coffee making facilities. The Ferry Schedule from Mainland : From Phuket to Ko Phi Phi (departing from Rasada Pier) – 8:30 am, 11:00 am, 11:30 am, 1:30 am. From Krabi to Ko Phi Phi (departing from Klong Ji-Lard Pier) – 9:00 am, 10:30 am, 1:30 am. Please note arrive at the pier at least one (1) hour prior to departure as schedule may change based on weather conditions. Guests who arrive at Phuket or Krabi airport after 12 PM (noon) will have to stay on the mainland and board the morning ferry to Ko Phi Phi. Visiting Phi Phi Islands is at the top of most travellers’ to-do list when they visit Thailand. So we decided to book something quicker for a trip out to Phi Phi Islands. Our resort suggested us to go for “The Original Phi Phi Sunset island Trip” and offered group tours in a big boat. Here is the general itinerary that is offered by tour providers. After a brief introduction by the tour operator, we proceeded to board the boat that carried about 10 + tourists from all over the world. Once everyone is seated in the boat, the tour guide greeted us warmly while the boat set sail for our first stop of the day – Ko Phi Phi Le. Depart around 1:30 pm from the resort and reach Tonsai pier. Arrive at the Monkey Beach along the way. Brief stopping at the Viking Cave on Ko Phi Phi Le. Head further south around the island to the Maya Bay. Stop at the beautiful Maya Bay for at least an hour to lose yourself in its beauty. Cruise into Pileh Lagoon. This is an incredible sight where giant limestone cliffs dwarf the long-tail boats and the water looks clear with the most magical shades of green with plenty of time for kayaking and snorkelling. Depart for Ko Phi Phi Don and arrive back at the resort. The Maya Bay, snorkelling and kayaking at Pileh Lagoon and the sunset were the best part of the day tour. The Pileh Lagoon between two boulders is extremely beautiful and scenic. The colourful sea life there offers great surprises. After a full day of swimming, snorkelling, sun and fun, we were happy to get back on the boat and relax our way home. At the sunset, we were served a fried rice and some fresh cut fruits. It was the perfect way to end our day watching the Sun playing hide and seek as we sailed across the islands in the Andaman Sea. We have no words to describe how much we loved everything in Ko Phi Phi Le. The white sandy beach, the impressive and breath-taking rock formations, the unique Maya Bay, the mesmerising sea life in the clear and turquoise blue sea waters. For a moment, we felt as if we had arrived in paradise and this has been one of the most amazing and unique experiences of our life. The best time to visit the Phi Phi islands is between November and April when the sea tends to be calmer, thus allowing easier access to the Bay. Come at odd hours to avoid touristy at the Maya bay when you book a day tour. Be sure to put the PP Princess Resort on the top of your list if you are looking for a perfect and romantic beach getaway. Overall, we were deeply impressed by the excellent service and hospitality offered by the resort. Of the 10days we spent in Thailand, this day was one of our absolute favourites. The combination of luxury, breathtaking scenery and sea-life is an absolute winner. We made many memorable moments ticking off one of our bucket list items (Visiting the Maya Bay of ‘The Beach’ movie fame). We’re glad we went with tour booking done by our Resort and highly recommend that you do too. They are the perfect company to visit Phi Phi islands tour with, because they are professional and luxurious. All in all, we would definitely recommend the PP Princess Resort to anyone who is looking for a quality accommodation in an easily accessible and convenient location, at a relatively affordable price stay in Phi Phi Island. To find out more & book directly on their website: PP Princess Resort Or find them on Agoda and Tripadvisor. And make sure to follow them on Facebook. Disclaimer: Interlude Journey were invited as guests of PP Princess Resort, but as always all opinions are our own and we would never recommend something we haven’t experienced and loved ourselves. This looks wonderful! I went there briefly in January but we struggled to find accommodation in our budget so just did a day trip. Really regretted not splashing out though as it looks amazing and the day went too fast! Phi Phi Island looks stunning and peaceful, like a paradise. I went to Bangkok years ago (22year ago) and I have always wanted to go back to explore the whole country. I can not say that I have heard of Phi Phi Island until now but it something that has definitely interested me in going too in the near future. I also love the Itinerary that you have put together, it has some great tips and suggestions. It sounds like you made a great choice at PP Princess Resort! We skipped the Phi Phi Islands when we were in Thailand and I regret it! We are thinking about making a return trip and doing some more island hopping, we will for sure add this to our must see list. I’ve been to Phi Phi many many years ago, when I was *cough* younger. Loved every minute of it and it’s an absolutely beautiful place. I do remember that we went to PP Princess Resort to ask if hey had an available room but they were sold out. I think it’s one of the most popular accommodations there. I have heard about this place before! I think one of my friends just stayed here recently and was raving about the pool. Wow! What a comprehensive guide and review of the Island and hotel. Your photos look amazing. There’s so much to love from the fantastic pool to the cute little sign saying we love Phi Phi! I would definitely make sure to look this resort up next time I am in Thailand. What a great guide! The Phi Phi Islands are top on my list of places to visit in Thailand, and infinity pools always entice me. I’ll definitely check out the PP Princess Resort – It looks like a great base for serious relaxation! I’ve only been to Bangkok in Thailand and I’m itching to go to the islands! I’ve heard so many great things about Phi Phi so it’s definitely on our list. The PP Princess Resort looks like an incredible place as a base. Thanks for sharing! The Phi Phi Islands are so much fun! Next time I go I’ll definitely check out Princess Resort. I love how close it is to so many attractions and would want to see that Reggae Bar. I bet they have great music! What a great guide. We have heard so many things about Phi Phi so it’s definitely on our list now. The island sounds so much fun. Looks like a great choice to stay at PP Princess resort. I’ve heard that Thailand is not an expensive travel spot as some may think. Phi Phi Islands look divine and I could really get a lot of enjoyment there. Whoa! This is so close to my country India. Wonder why I have not planned a tip here yet. Time to plan a holiday! The resort looks lovely and is so close to many beautiful sights. Their amenities are impressive and the pool looks nice. I would like to go to the beautiful beaches nearby and it would be so convenient to stay at this resorts with all your needs taken care of. What a beautiful place to stay. I looks very modern and that infinity pool is amazing. And how could anyone say no to a pool party? Phi Phi is amazing. After living for 2 years in Thailand its always on top of our list in Southern part. I went to Phi Phi in 2007 and agree that it’s a beautiful place. Unfortunately it has to rank as one of my worst travelling experiences as I got food poisoning from a restaurant and spent the whole time in my room ill. By the time I’d recovered my friends had seen everything and it was time to move on! Perhaps I’ll have to return. It does look as though it has been built upon quite extensively since 2007 when it was recovering from the terrible tsunami disaster. Phi Phi looks like a paradise 🙂 And the resort seems to be a really nice place to stay. Thanks for sharing! Hats off to you for such a detailed info on the place. It sounds like such a exotic place. I am adding this to my must stay list if ever I get there. The resort looks really comfortable and fun. The pool party does sound like a fun thing to do. Phi Phi islands of course, are just gorgeous. Every picture of it tells me how much fun one can have here with snorkeling and kayaking. Thailand is a paradise on Earth…I’m going to visit again in February…so excited to see new places of this amazing country…Phi Phi Island was one of my fav…Thanks for your detailed informations 🙂 it will be precious for me. Ahhh Ko Phi Phi, such a spectacular place! I’ve visited some 4 years back and stayed in a somewhat less glamorous accommodation, but in any case nothing beats what the nature has in store for you! Beautiful resort. It is good to see that they have the arrangements for a lot of outdoor activities. Appreciate the amount of hard work you have done to provide so much details. Lovely – Ko Phi Phi is popular for a reasons. Your hotel choices sounds amazing. I usually just say in small guesthouses or hostels…but splurging is always nice every now and then. Great post! I really like how your break down your stay at this resort. The rooms looked beautiful! It sounds like a great place to stay that has a little bit of everything. We will definitely keep this resort in mind when we plan our visit.